Better than expected earnings and an end to its backlog draw-down pleasantly surprised Wall Street last month. 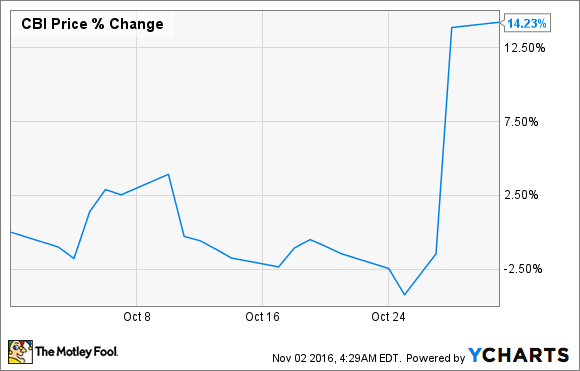 Shares of engineering and construction firm Chicago Bridge & Iron Company (NYSE:CBI) climbed 14% in October after the company posted better than expected earnings results for the third quarter and reaffirmed its guidance for 2017. Image source: Chicago Bridge & Iron Company. Despite its name, the bulk of Chicago Bridge & Iron's business comes from engineering, procurement, and construction contracts in the energy business for projects like LNG facilities and power plants. This explains in large part why the company has seen revenue decline in recent quarters. Basically, big spending oil and gas producers aren't pushing back final investment decision dates for many of its major projects. What made this quarter particularly promising for the company was that it exceeded expectations for sales and earnings, but the big point was that its new awards improved 50% compared to the prior quarter and its total amount of new awards was just about equal with its revenue for the quarter. This is an important point because it means that the company isn't drawing down on its backlog for revenue. It also signals that energy companies are starting to see the end of this major decline and are willing to start spending again, albeit at lower levels than before. This is a great step in the right direction for Chicago Bridge & Iron. So far in 2016, the company had drawn down its backlog of work by 12%. This quarter's book to bill ratio of 1 -- same amount of work coming in as going out -- is a great sign that things should start improving. On top of that, the company has continued to keep its financial house in order throughout this downturn and is poised to be in a better position when energy companies open their wallets again. If the company can maintain this, then it's certainly a stock worth watching.